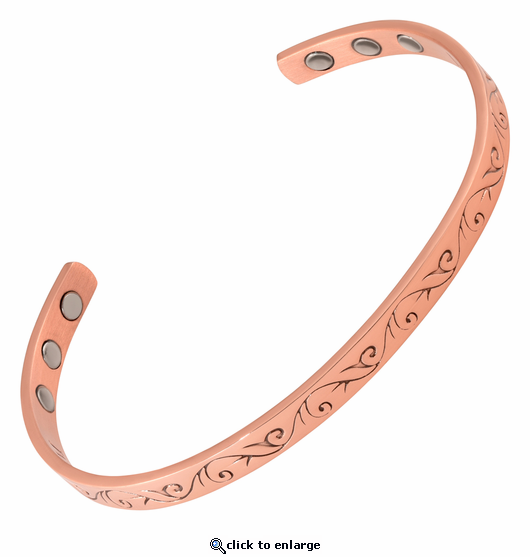 This copper magnetic therapy bracelet has a superb design. Styled in pure copper solid metal, this magnetic bracelet has 6 powerful 3000 gauss neodymium rare earth bio north facing magnets and stainless steel magnet caps for added durability. Slender at about 1/4" wide, this is a wonderful looking therapy bracelet and the picture does not do justice. Both ladies really liked them! Great order and great customer service. I received my order pretty fast and have been wearing it ever since and have gotten a lot of complements as well.